On this page of the Wizard, enter the basic POP3 collection options. The POP3 Server Address is the mail server address which VPOP3 needs to connect to in order to retrieve mail. Usually your Internet provider will give you the name of the server. If you don't have the information your Internet provider gave you, then either contact your Internet provider or look on their website (for instance, search for 'POP3 server' or 'Mail server'). The POP3 Account Name is the account name from which VPOP3 will collect mail from the above server. Some Internet providers will call this a 'user name' or a 'mailbox name' or other similar terms. This does not have to be the same as any other details within VPOP3, such as VPOP3 usernames. Your Internet provider will have given you this information. There is no standard form for this information, so we can't tell you what it will be. It could be your full email address, or the part of the email address before the @ symbol, or a totally arbitrary sequence of letters & numbers. Contact your Internet provider if you do not know what this is. The POP3 Account Password is the password needed to log into the account specified above. This does not have to be the same as any other details within VPOP3, such as a VPOP3 user's password. We cannot tell you what this will be. If you do not know what it is, contact your Internet provider. The POP3 Authentication Method tells VPOP3 how it should send the login details to the Internet provider. Most Internet providers use the Plain Text method. The APOP and CRAM-MD5 methods send the password encrypted using a one-way hash. These options are widely supported, but not as common as the plain text method. Your Internet provider will tell you which option you should use. If in doubt, try the Plain Text method first. This option is usually used where your Internet provider sorts out mail into individual mailboxes. With this option, VPOP3 simply downloads messages and delivers them to a specified local user or list. This option is usually used where your Internet provider sorts out mail into individual mailboxes. With this option, VPOP3 downloads messages and sends them on to a specified email address on another mail server using LAN Forwarding. You may wish to use this if you are using VPOP3 as a mail collector for another mail server that you operate such as Microsoft Exchange Server. Do not use this option if you do not manage the other mail server. 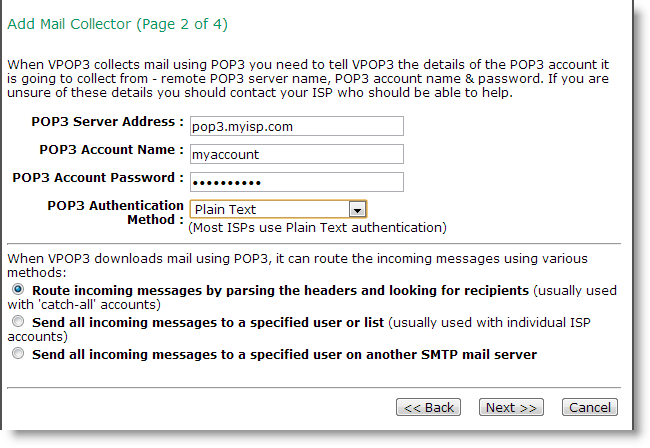 If you want VPOP3 to download messages and forward them to an external email address using normal message sending, then create a Distribution List with the external email address in, and choose the Send all incoming messages to a specified user or list option to deliver messages to that Distribution List.